Bon Vivants Ladies’ Group: Ready, Set, Sew! My fabulous friend, Husband’s hairdresser, and fellow blogger Missy of the blog “Technicolor Cutie” started a vintage ladies’ group here in Los Angeles a few months ago. One day a month, a gaggle of us gals get together and revel in our love of vintage. We try to pick a theme to share a skill or passion we have for things that are related to the vintage lifestyle. This month was hosted at my house, and it was called Ready, Set, Sew! Missy was kind enough to teach us Sewing 101, and the machine I’ve let sit unused since our wedding reception a year ago is now churning out raised hemlines and stuffed animals with lightening speed! I’m going to edit and upload a video of it soon. Meanwhile, you can read her blog entry and pics about it here. 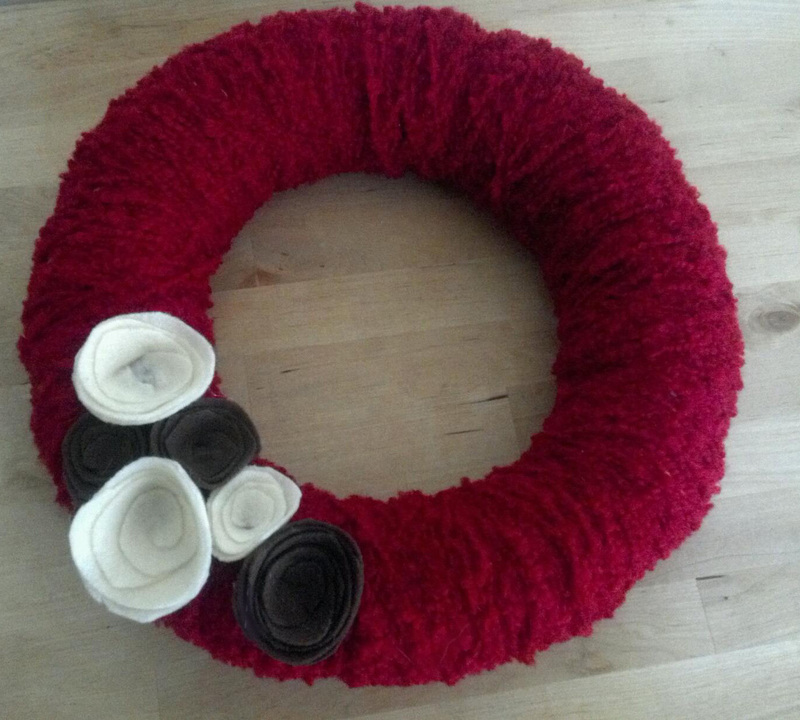 I’ve always loved the idea of wreaths on the door for seasonal changes…. especially the holidays and for spring. This one is really pretty and basic, and it’s cheap to make! Choose whatever colors you like. I chose red yarn with cream and brown flowers, which I feel works for the fall and winter holidays, but you might choose greens, whites, yellows and pinks for Spring.